Enjoy the 50% off Storewide. Fret not! Here's another chance for you to grab deals from ELC! Starting tomorrow, they are having a Storewide 50% off sale at their Vivocity outlet! ELC members enjoy additional 5% off when you purchase min. of $500! Limited stocks are available so hurry down before they run out! Terms and conditions apply. 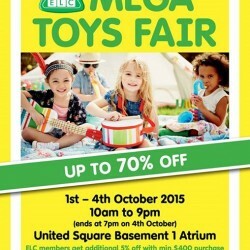 Here's a great chance to grab one at their United Square Mega Toys Fair! Happening from 1-4 October at United Square Basement 1 Atrium with great bargains of up to 70% off! This time round they have many more exciting brands the likes of Janod, Lacosa and Hape joining us! 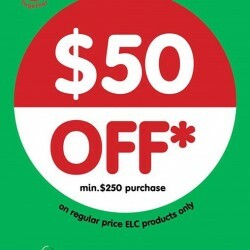 Whats more, all ELC members enjoy an additional 5% off min. $400 purchase when they present the EDM sent to their registered email account! See you all on 1st October at United Square Basement 1! Here's a great chance to encourage your child to engage in outdoor activities and sweat it out with fabulous toys from ELC! 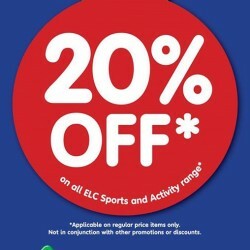 Promotion valid until 23rd August, all ELC Sport and Activity range of toys at ELC Paragon, United Square and Seletar Mall will be going at 20% off! Whilst stocks last! Here's something to chase the blue away! 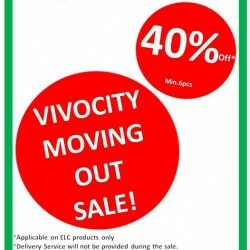 Early Learning Centre Vivocity Moving Out Sale is happening now! Enjoy Storewide 40% off with minimum 6pcs purchase of Early Learning Centre items! So head on down to Early Learning Centre Vivocity #02-70 now! Whilst stocks last! Early Learning Centre's SG50 promotion is now on! From now until 10th August, get $50 off minimum purchase of $250! Hurry down to Early Learning Centre Paragon, United Square and The Seletar Mall to celebrate Singapore's 50th birthday! Terms and conditions apply. Enjoy and get Missed out on our storewide promotion over the last weekend? Fret not! 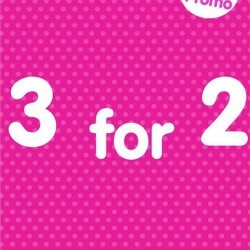 We have another amazing promotion running in store now - Buy 2 Get 1 Free*! hurry grab yours Today! Happy shopping! 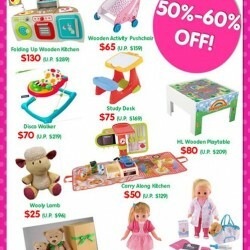 Enjoy and get this at early learning centre and get up to 50% off discount storewide. hurry grab this now! The SALE you've been waiting for is back! 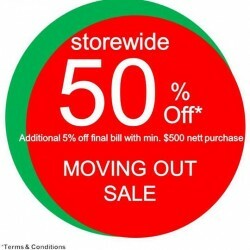 Storewide 50% off! 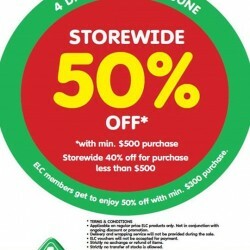 For 4 Days only, 11-14 June, spend a minimum of $500 and enjoy 50% off* at all ELC stores! Hurry down before your favourite toys run out, whilst stocks last! Terms and conditions applies. 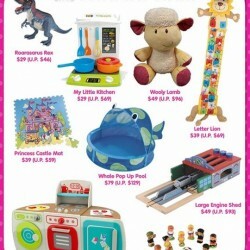 Early Learning Centre Check out these amazing deals at our stores going at 50%-60% off! Whilst stocks last! Wow! Starting today (10th) they are giving away a $50 voucher with every $180 purchase! Hurry down as vouchers are limited! T&Cs apply. Valid on regular price items and purchase must be in a single receipt. Not in conjunction with ongoing discounts, promotions and vouchers. Yuppie! Its a long weekend! 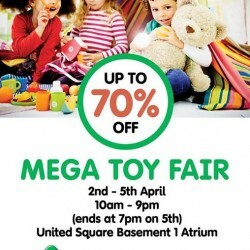 There's no better way to spend it then to shop at their Up to 70% off Mega Toy Fair tomorrow! Happening from tomorrow 2nd April till Sunday 5th April, 10am-9pm daily (ends at 7pm on Sunday) at United Square B1 Atrium! Come down fast as stocks are limited! Dear Customers, thank you for the overwhelming support at their Forum Moving Out Sale! They're pleased to announce that they had just replenished their stocks for 50% off Storewide, so please do drop by ELC Forum to checkout more great bargains! Seeya! Storewide 50% off is back! 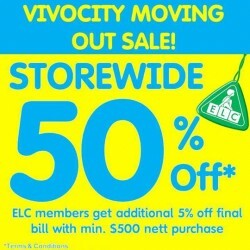 Come join them tomorrow at ELC Forum #02-05 for their Storewide 50% off Moving Out Sale. Additional 5% off with minimum $500 nett purchase! Hurry down stocks are limited! Only at ELC Forum! T&Cs apply. Fight off your mid-week blues! 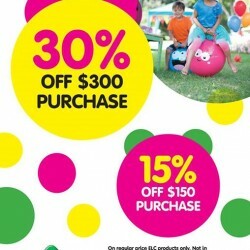 Enjoy 50% off every 2nd piece purchase at Early Learning Centre! Excludes all 3rd Party Products. Applicable to lower priced product. T&Cs apply. Get your little ones some new toys this Lunar New Year with special discounts at 40% off min. 5 items and 20% off min. 2 items! Promotion available now at all 5 stores (Paragon, Forum, United Square, VivoCity & Seletar Mall)! 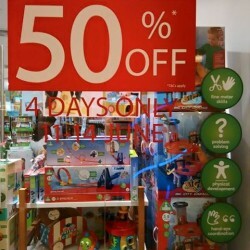 Early Learning Centre offers you a Special Buys on Selected toys at discounted prices of up to 55% off! 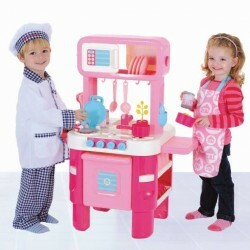 These hot favourites toys are going at 40% off at all Early Learning Centre! Hurry down to the any store and don't miss the attractive offers! 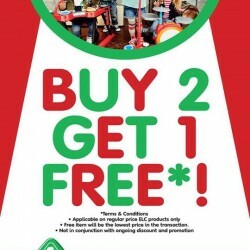 Get your little ones some new educational toys and enjoy a sweet 3 for 2 promotion at Early Learning Centre. Take note that the offer is not applicable to 3rd party items and any ongoing promotions. Valid at Early Learning Centre @ Paragon, United Square, Forum & VivoCity! It's a promotion for your little ones! 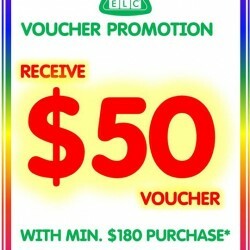 Early Learning Centre Singapore (ELC) is having GSS promotion at all Outlets! 30%-50% off on selected styles. visit all ELC outlets for more details.